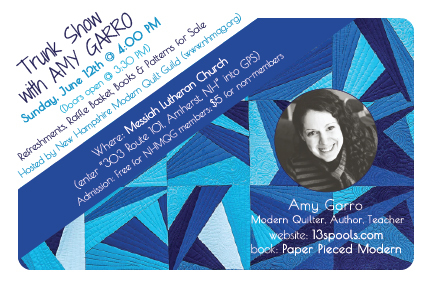 New Hampshire Modern Quilt Guild: Join Us for Two Events with Amy Garro! Hello friends! It’s Michelle here, one of the NHMQG vice presidents. I have a pretty good gig with our guild. I get to schedule events outside of the meetings, including workshops, trunk shows, and other cool stuff. And if you haven’t heard, we’re kicking off the summer next month with a weekend with Amy Garro. 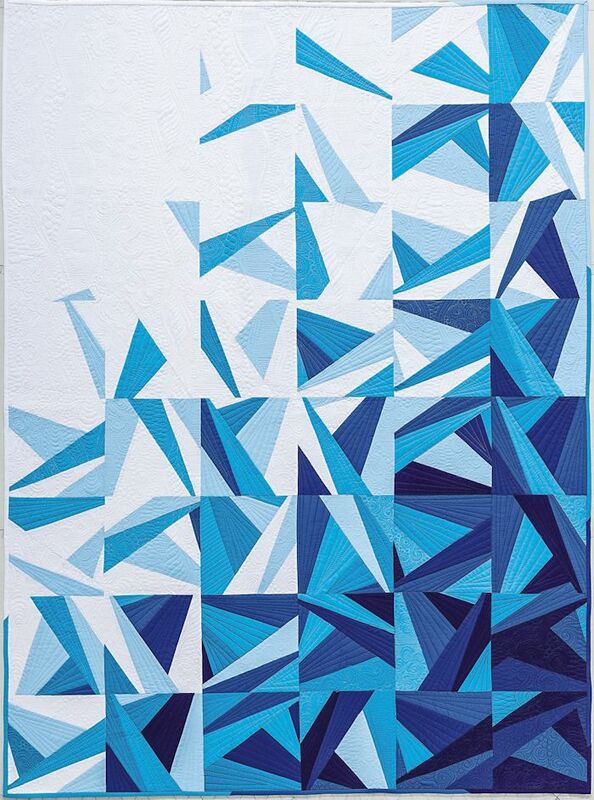 Amy is a modern quilt designer, known for her precision paper piecing, creative free-motion quilting, and angular, at times masculine, aesthetic. She’s also an author, blogger, and teacher. Icy Waters is an intermediate paper-piecing workshop. Participants are required to own a copy of Amy’s book, Paper Pieced Modern, which contains the pattern we’ll need for the day. If you haven’t been to Quilted Threads before, it alone is reason to venture to Henniker. They have everything—modern fabric, Japanese fabric, tons of Cotton and Steel, some more traditional fabrics, and a sweet sale room. Workshop participants will enjoy 15% off regularly priced merchandise the day of the event. We’ll start the day off with scones and fruit, and we’ll break for an hour in the middle of the day for lunch. Lunch is included in the price of the workshop, and our spread will feature salads, wraps, and dessert. If you’re interested, email me at michelle.l.cain (at) gmail (dot) com, and I’ll fill you in on how to sign up and prepare for the workshop. At this afternoon trunk show with Amy at Messiah Lutheran Church in Amherst, NH, participants will be encouraged to view Amy’s designs up close. Admission for this event for NHMQG members is free. Admission for the public is $5/person. We look forward to seeing you in June or at a monthly meeting in the near future!